After mocking Lorraine and her “baking is always easy” motto, it’s good to see her take on the whisked sponge. Needless to say, she doesn’t list all the potential pitfalls, as that would rather detract from the “easy cooking” image. In fact, this isn’t a fatless sponge; it’s more like a giant brownie covered in fudge icing. But that is no bad thing! You make the cake in two separate bowls. The largest one has the egg yolk mixture in and the smaller one has the whites in. (Later you’ll be folding the whites into the yolks.) You start off the yolk mixture by whisking yolks and caster sugar together. Then you melt some butter and fold in 180g dark chocolate which you have been madly trying to grate for the last hour. I grated about 20g of it before giving up. Most of it went on the worktop and my arms were aching. Dark chocolate (especially dairy-free stuff) is quite brittle so is hard to grate. I had a think about why I couldn’t just melt the chocolate as well in the pan. I decided that the answer was probably because it would cook the egg yolks when you added them. So I just nuked the chocolate in the microwave until it was just melting, added it to the butter and let the whole thing cool down a lot before adding to the egg yolks and sugar. You then whisk the egg whites “until they begin to turn opaque.” I have no idea what this means, and Delia’s “stiff but not too dry” also bewilders me, so I used the old turn-the-bowl-upside-down trick. Remember, if you are using the same whisk/mixer as you used for the egg whites, it must be “spanking clean.” Whisk in more sugar and fold the whites into the chocolte yolk mixture. Then fold in ground almonds (which is why this can be gluten free). Pour into a large loose-bottomed cake tin and cook for about 40 minutes at 150’C in my oven (no, don’t cook it in my oven, unless you happen to live in my house), or 170’C for a non-fan oven. 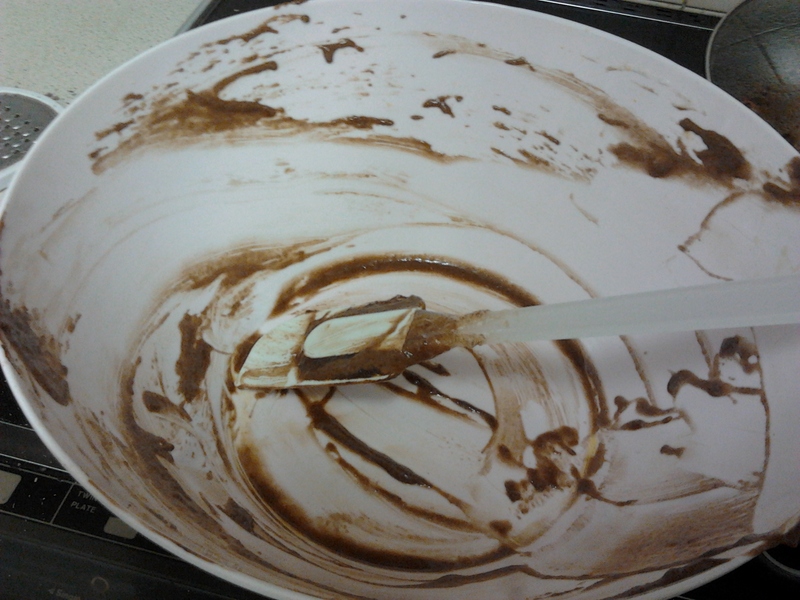 While you wait for it to cook, you can lick the bowl clean. Yes, it’s made with 6 raw eggs, but I didn’t go to all the trouble of making it dairy-free to then not revel in the pleasure of licking the bowl out. 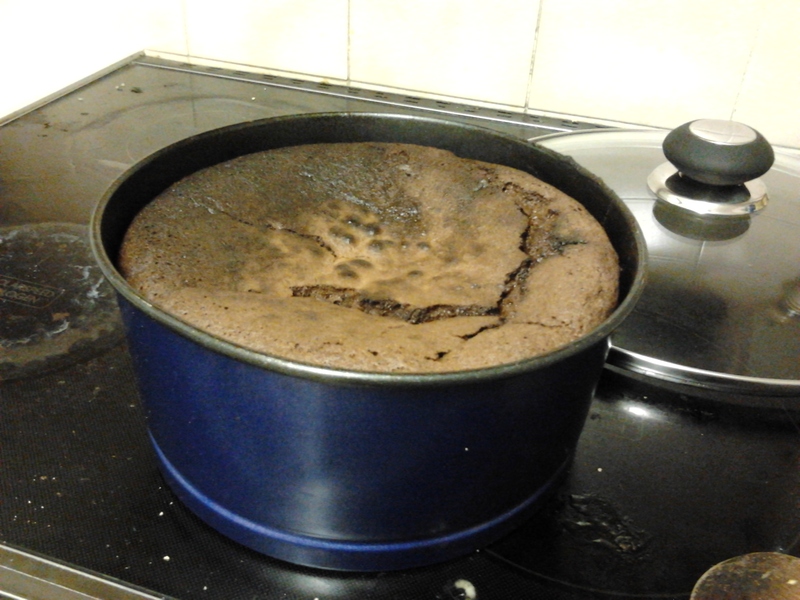 Check on the cake after 30 minutes. 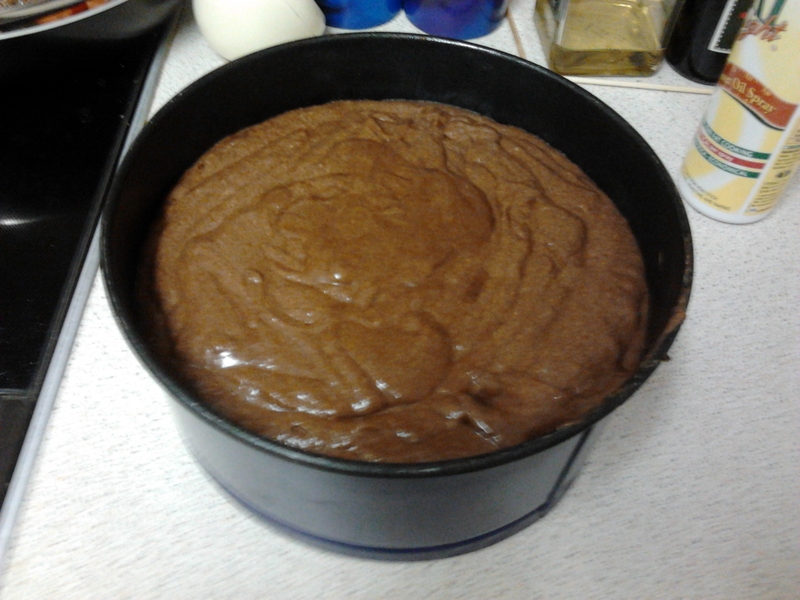 Like a brownie, you want it cooked but still gooey in the centre. A wooden skewer would come in handy here. 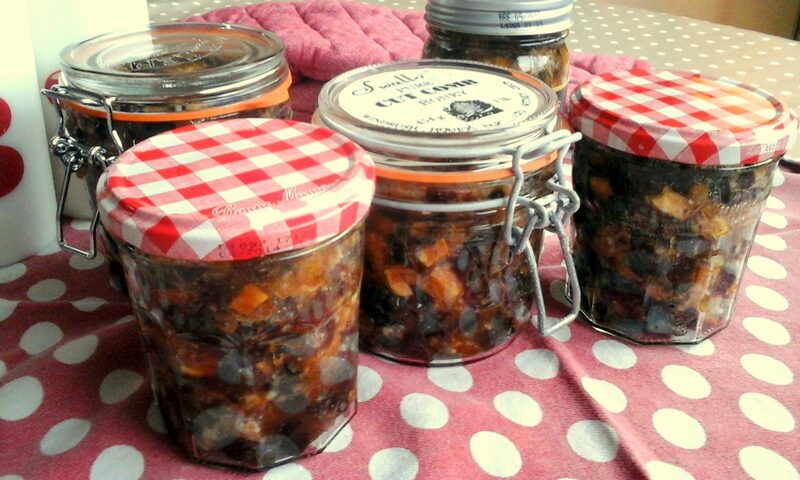 Leave to cool completely in the tin. It will sink a little in the middle, but you can cover that up with the frosting. 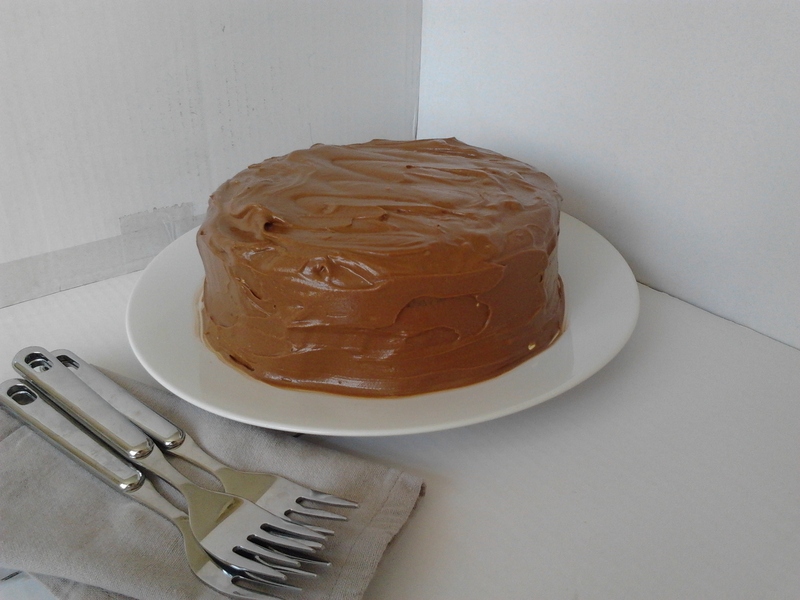 The frosting is chocolate, butter and icing sugar and Lorraine asks for it to be slathered all over the cake. I found the frosting a bit rich and wished I slathered slightly less enthusiastically. However, everyone else loved it, and one person had three slices. Greedy person or great cake, you decide. This cake is in the dessert section of the recipe book, not the cake section. 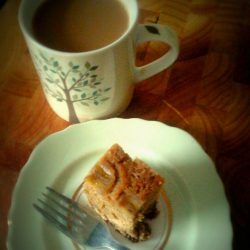 However, it certainly is a cake and would go fine with a cup of tea. But I agree that it would be a shame to limit it to that, so knock yourself out – have it for dessert, or even breakfast. Hm.. who could that person be?! It actually wasn’t Rob! I took the cake to church. Rob had to try all the cakes obviously, so he only had two slices of mine.